News – Page 2232 – Welcome to Wyandotte Daily! Accidents on eastbound I-70 at 6:35 a.m. Wednesday caused two injuries, according to trooper’s reports from the Kansas Turnpike Authority. A light rain was falling during part of the morning. The first accident, at 6:35 a.m. Oct. 22 near the I-70 exit to Park Drive in Kansas City, Kan., involved a 2004 Chevrolet four-wheel drive vehicle and a 2008 Chevrolet four-wheel drive vehicle, according to the trooper’s report. The driver of the 2004 vehicle changed into the lane in front of the 2008 vehicle. The 2008 vehicle was unable to stop and struck the rear of the 2004 vehicle, the report stated. A 26-year-old Kansas City, Kan., woman driving the 2004 vehicle was injured and taken to the hospital. A 32-year-old Kansas City, Kan., man driving the 2008 vehicle was not injured. Later, traffic had slowed to a stop because of the accident, when another accident occurred, according to the trooper’s report. The second accident was on eastbound I-70, near the Indian Springs exit, right after the first accident. The trooper’s report stated that a Mack truck driven by a 31-year-old Edwardsville, Kan., man was going too fast for conditions and could not get stopped. The truck then sideswiped a school bus driven by a 53-year-old Kansas City, Kan., man, and then the Mack truck hit a Chevrolet sport utility vehicle in the rear, according to the trooper’s report. The driver of the SUV, a 23-year-old Kansas City, Kan., woman, was not injured, the report said. The drivers of the Mack truck and the school bus were not injured, the report stated. A passenger in the Mack truck, a 41-year-old Independence, Mo., man, was injured and taken to the hospital, according to the trooper’s report. 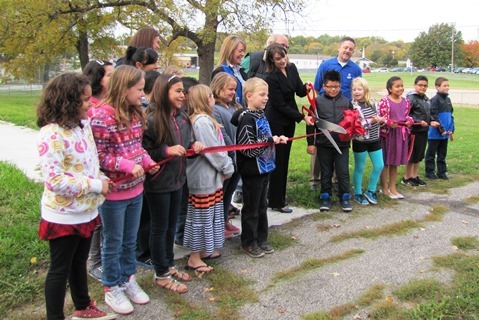 With the help of students from Junction Elementary School, the ribbon was cut today for new sidewalks in the Turner area. 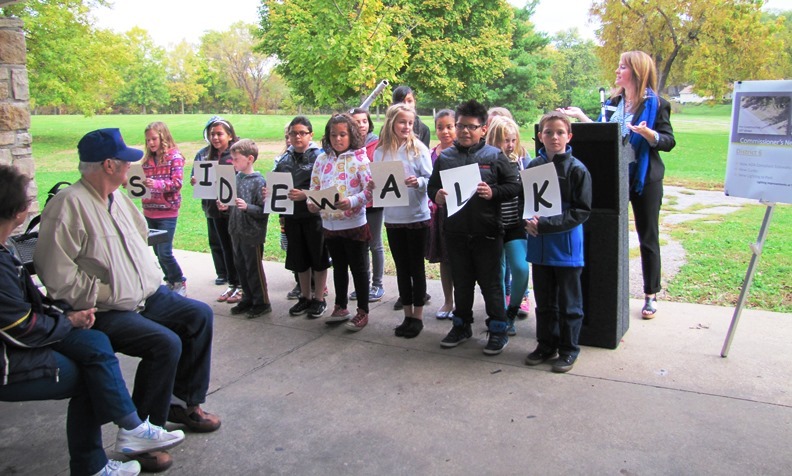 The sidewalk improvements are expected to make it safer for students to walk to school, according to Unified Government Commissioner Angela Markley, 6th District. They also are in keeping with the healthy communities initiative goals in Wyandotte County. 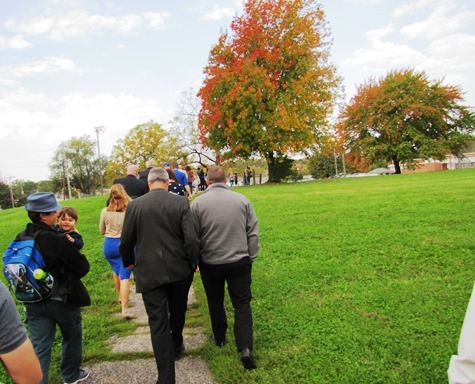 During the ribbon-cutting event, the group walked a short distance on a pathway from Matney Park at 42nd and Shawnee Drive to the nearby Junction School, enjoying the beautiful autumn weather. 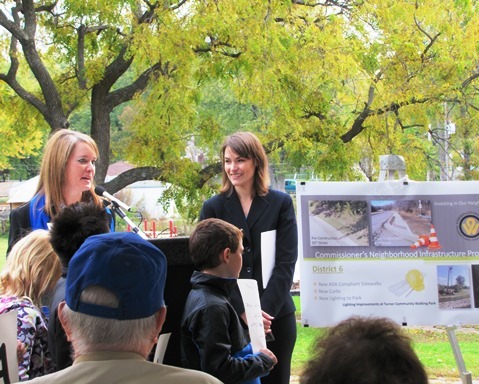 About $210,000 was spent on the project from the Commissioners’ Neighborhood Infrastructure Project (CNIP). Commissioner Markley estimated the cost of sidewalks at $100 per square foot. Mike Tobin, UG director of public works, said the project included 925 feet of sidewalks, plus lighting and curb work. Under this program, each commissioner has about the same amount of money to spend on projects he selects in his district. The source of the funds is the sales tax approved in 2010, according to the UG. In all, the districts have $4.4 million to spend on projects selected by each commissioner. In the 5th District, the CNIP project was the renovation of the Piper community center, and in the 4th District, it was the improvement of an athletic field. Since the amount of money can fund only a small project in each district, Commissioner Markley said it was decided in the 6th District to work on sidewalk projects near schools that are in heavy traffic areas, to improve children’s safety in walking to school. She said she received about 200 responses from her community survey of residents, plus she talked with groups in Turner about their priorities for spending the CNIP funds. The sidewalks near Junction School are now connected with a walking trail at Matney Park. In addition, new improvements of sidewalks and curbs on 55th, Hagemann to Oak Grove Road, are in keeping with Americans for Disabilities Act requirements. Lighting was enhanced for the Turner community walking park. Turner historically has been a rural area, changing over the years to a suburban area, where sidewalks were not part of the original plans for some developments. Commissioner Markley said she is now working on the CNIP project requests for 2015. Many residents have asked about improvements to Key Lane, she said, but after meeting with the Public Works Department she discovered it would cost more money than CNIP could provide. The Key Lane project will be placed on the list for usual UG public works projects, she said. Commissioner Markley said it is likely that the second round of CNIP funding for the 6th District will go toward similar sidewalk projects. An accident on K-32 at 98th Street in Edwardsville at 8:18 p.m. Oct. 21 resulted in injuries, according to a Kansas Highway Patrol trooper’s report. A 2001 Chevy Venture was northbound on 98th Street and failed to yield to a Honda Accord that was eastbound on K-32, the trooper’s report stated. The Accord then struck the Venture, according to the report. The driver of the Venture, a 28-year-old woman from Houston, Texas, was injured and taken to a hospital in Kansas City, Kan., according to the report. The driver of the Accord, a 32-year-old woman from Edwardsville, Kan., also was injured and taken to the hospital.